With as much going on at or near the Mall and Pennsylvania Avenue this weekend, you may see this sculpture if you head that way. 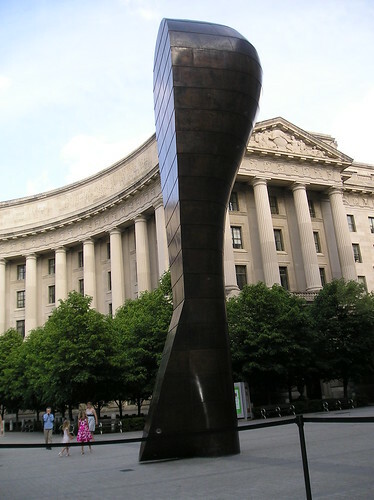 Its located in the plaza formed by the Post Office Department and the Ronald Reagan building. Then: Photographed ca. 1921, the reserve at Park Place, Park Place and Rock Creek Church Road, NW. This image was taken as park of a survey of the City’s many reserves. Now: Still a green, tree filled area, the reserve now has a sidewalk. The streetlight has been removed and replaced by modern versions. In 2007, the reserve received new trees with the assistance of Casey Trees, which are all still doing well. If you happen to be at this location, you may want to take note of the house to the right in the earlier photograph. Though you can’t see it in the now photograph above, the porches in the earlier photograph are no longer there. June 13, 1914: The Post reported that excitement was running high in the camp of the Grand Army of the Republic because of the full military honors accorded a Confederate soldier, Thomas Findley, who was buried the previous Thursday at Arlington National Cemetery with the customary three volleys fired by a firing squad from Fort Myer and the sounding of taps … the customary honors accorded Union men. Some members of the G.A.R. resented the honors accorded the burial and believed the South should have its own cemetery.